Should You Perform DIY RV Roof Repair? Posted on January 27, 2017 by Greg Kaz. When you own an RV, you should take the time to learn how to maintain and perform at least some repairs on your own. When you know how to take care of at least the basics, you will find increased confidence in your own abilities to keep your vehicle running and in good shape. You should learn how to do some basic engine repair, how to check the tire pressure and add fluids. You might also want to learn more about RV roof repair, just in case. Having something go wrong with the roof of your RV is one of the worst things that could possibly happen to your RV. A leaky roof means damage as soon as it starts to rain, so you want to find and eliminate these problems as quickly as you possibly can. Fortunately, when it comes to RV roof repair regarding things such as leaks, it is easier than you might imagine. One of the best ways to take care of a leaky RV roof is with Liquid Roof. This is a liquid material that you can paint onto your roof. It is essentially a barrier or membrane that will keep out the water to protect you from leaks. It goes on very easily, and this is one of the RV roof repairs you can do on your own without much trouble at all. Before you apply the product though, be sure to read the manufacturer’s instructions and follow them. You will need to clean off your entire roof. Remove the dirt and debris. If you have an RV that has a few rust spots on the roof, it is a good idea to use a wire brush on these spots to remove the surface rust. Clean it off before adding the Liquid Roof. This way, it will have a much easier time of adhering to the roof. For the actual application of the EPDM, you can use paint rollers and brushes. Apply it in an even coat. One of the nice things about the product is it will continue to cure even if the weather turns nasty and wet, so long as it is above 55 degrees F. Make sure you check the weather before you apply the product though, as it will cure faster when it is nice out. Some other types of RV roof repair are simple enough for DIYers as well. Replacing flashing and vents, for example, tends to be easy and you can find instructions and tutorials that can guide you through the process. Even though there are many different types of RV roof repair you can do on your own, if the roof has some serious damage, you will want to get in touch with the professionals. It will eliminate the chance of you doing something to the roof that could damage it further. They can provide you with the help you need when it comes to keeping your roof in good shape. Posted on December 12, 2016 by Greg Kaz. When you buy an RV, chances are good that you’re thinking about things like fuel economy, engine performance, towing capacity, the number of beds and seats provided, and other considerations. It’s pretty unlikely that you’re thinking about the roof, or the possibility that it will leak. However, RV roof leaks are not uncommon, and they become much more likely as the roof ages. Here are some of the more common causes of RV roof leaks to bear in mind. A number of vents, skylights and other elements actually pierce the roof of your RV. Where these meet the roof, you need to have a watertight seal. This is usually done with caulking. However, over time, caulking dries out. It can dry and shrink, pulling away from the very seams and edges it is meant to protect. If left untreated, it will eventually crumble away. It’s highly recommended that you reapply caulking once per year or so on the roof of your RV. While not all RVs have them, roof racks are handy. They allow you to store extra items, extra equipment and more. However, because these are attached directly to the roof of the RV, there’s the potential for leaking over time. RV roof leaks from roof racks tend to be located around the screws that hold the rack to the roof, and usually coincide with caulking degradation or seal failure. Most RVs have a ladder that grants you access to the top of the RV. While important and definitely more convenient than carrying a ladder with you at all times, the ladder’s mount points can become the source of RV roof leaks. There’s also the potential for leaks on the back of the RV where the ladder is located (where it attaches through the side to the frame). One of the more common causes of RV roof leaks is damage to the roof itself. Falling tree branches are a good example of this, but such damage can be caused by any number of other things that come into contact with the roof. Even something with enough weight that just sits on the roof for an extended period can eventually cause damage. The aging process, combined with exposure to the elements, will eventually weaken the roof of your RV all by itself. Over time, this can lead to leaks through damaged roofing material. Sunlight, freezing temperatures, and precipitation will all take their toll. Repairing RV roof leaks can be a time-consuming process if left until the leak has caused significant damage. In a worst-case scenario, you might be looking at having the entire existing roof torn off, as well as damaged parts of the siding, and then replaced. It’s a better option to take a proactive stance and use a product like Liquid Roof to handle RV roof leaks while they are still relatively minor. Posted on October 26, 2016 by Greg Kaz. What would you say is the most critical part of your RV? Is it the engine? Maybe it’s the HVAC system. Perhaps it’s the size of the fresh water and waste water tanks. All of these are certainly important, but the roof is even more so. If the roof is in good shape and prevents water from leaking in, you’ll enjoy a comfortable trip no matter where you might be bound. However, if the roof is aging, or already suffers from leaks, it’s a different story. 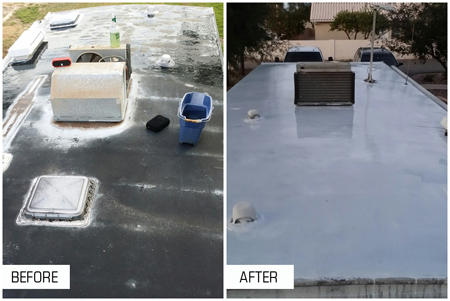 RV roof coatings can be used to breathe fresh life into your existing roof, sealing leaks and giving you years more enjoyment out of the vehicle. Of course, they’re not all the same. One of the most important considerations when comparing RV roof coatings is compatibility with the original material used to construct the RV’s roof. Manufacturers use several different materials, and not all coating products are compatible with each type. While you have plenty of options, Liquid Roof is one of the few that can be applied to just about any existing roofing surface with a little bit of prep work. When Does It Become Waterproof? One of the most widely used RV roof coatings in the industry is a liquid acrylic elastomer product. Lightweight and relatively durable, these products offer some benefits. However, they are not immediately waterproof. This means that any exposure to moisture during or right after application can cause serious problems. Liquid Roof does not have this issue, and is waterproof as soon as it is applied to the roof of your RV. Some RV roof coatings on the market are applied easily enough, but they shrink as they cure. This can complicate matters, meaning that you need to apply more of the product than you would with another option. Liquid Roof does not shrink as it cures, ensuring that the areas to which it is applied remain protected even after it has finished drying. It can also be applied in just a single layer (called a ply), which reduces the amount you must use. Finally, make sure that any UV roof coatings you’re considering maintain their flexibility after they have dried. 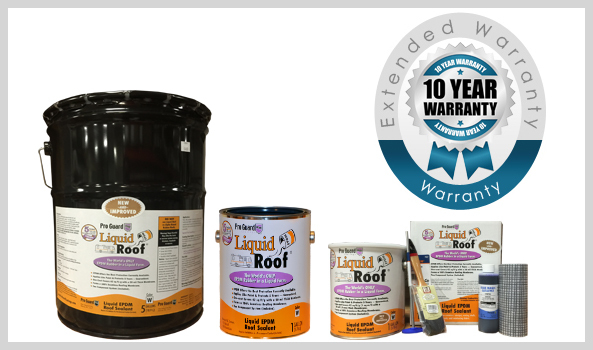 Liquid Roof maintains its flexibility, but other products can become stiff and brittle after curing. This makes them much more easily damaged, and can reduce the lifespan of your roof. As you can see, Liquid Roof is one of the best options for anyone considering RV roof coatings to repair or replace their existing roof.